Trunk roads are high speed routes where even minor accidents can cause huge congestion, and road or lane closures are to be avoided at all costs. Roadside structures on the trunk road network are required to be passively safe, and Glasdon offer a number of passively safe, crash friendly products to complement them. 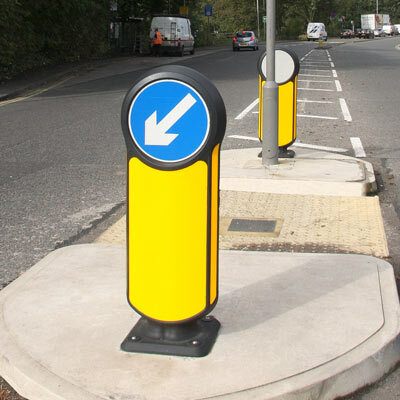 Our range of bollards and verge markers / hazard markers includes options made from passively safe materials that will return to an upright position after impact. Our products are tested to the highest European standard to ensure they will cause no damage to a vehicle or its occupants in a collision, as required by many highways authorities for high-speed roads. Glasdon innovative Chevroflex system is a self-righting, modular alternative to traditional steel chevron boards. Where metal signs create a significant potential hazard if struck, Chevroflex Ultra is made from specially engineered Impactaflex material, which will return to its original shape after a drive-through collision. The latest generation of Chevroflex has been independently tested and proven to be passively safe to BS EN 12767:2007 at Performance Standard NE3/100.